Humanities Texas is pleased to announce that Victoria Longoria of Del Valle High School is one of 13 recipients of the 2017 Humanities Texas Outstanding Teaching of the Humanities Award. U.S. Congressman Lloyd Doggett and Humanities Texas Communications Officer Marissa Kessenich presented Longoria with her award during a ceremony at Del Valle High School on Monday, November 27. Longoria, who has taught English for over 20 years, currently teaches 11th grade AP English Language and Composition at Del Valle High School. In 2016, she was a state semi-finalist for the HEB Excellence in Education Lifetime Achievement Award. Longoria is an avid proponent of fostering a global perspective within her students. In addition to choosing international texts, she also aligns her English curriculum with the history department, collaborating on an interdisciplinary approach to deepen her students’ understanding of both subjects. She frequently attends both local and international seminars to bolster her own understanding of the material she teaches. Longoria received a $5,000 cash award, with an additional $500 for Del Valle High School to purchase instructional materials. 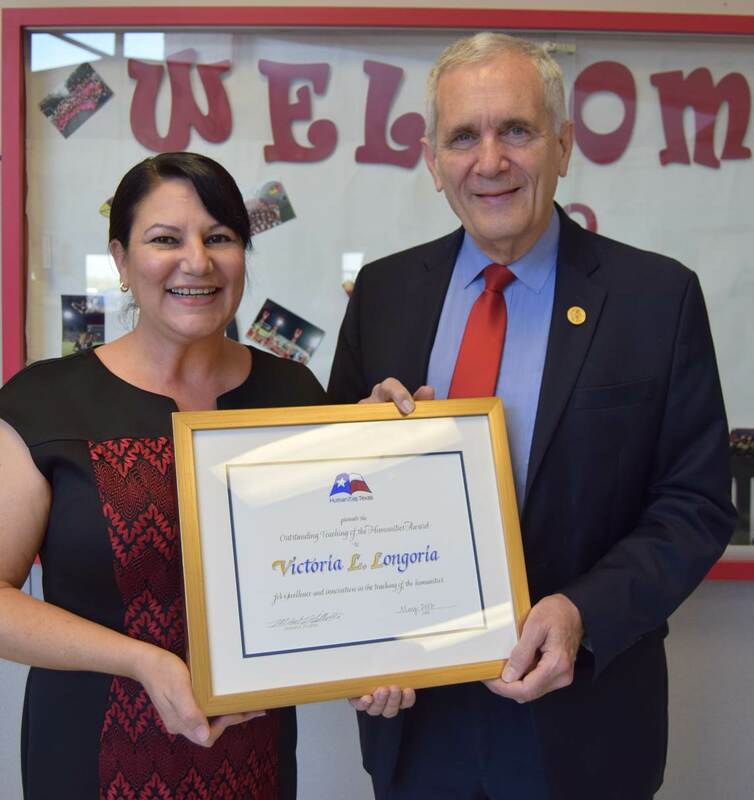 Victoria Longoria with Congressman Lloyd Doggett.